It seems fitting that a book about a man who collects lost things, hoping to return them to their rightful owners, would arrive on my doorstep as a surprise. I hadn't requested a copy for review - or, truthfully, even heard anything about the book. But a kind publicist thought it might be a good fit and sent it my way. I have no idea if I would have discovered The Keeper of Lost Things on my own, but I'm so happy I had the opportunity to read it! It's a quiet novel, but it contains a magical and meaningful story about the things that connect us. Many years ago, Anthony Peardew lost a cherished keepsake and the love of his life on the same day. Both losses have haunted him ever since, though he has managed to find some healing by rescuing misplaced objects that he finds. As he nears the end of his life, he realizes that his personal mission - to reunite the objects with their owners - is still unfulfilled. So, he bequeaths his estate and his collection to his assistant, Laura. She's a lost thing in her own right - recovering from a bad divorce and brokenhearted about the way her life has turned out. Anthony's home is a safe haven, and his "assignment" just might be the push she needs. "When he had started gathering lost things all those years ago, he hadn't really had a plan. He just wanted to keep them safe in case one day they could be reunited with the people who had lost them. Often he didn't know if what he had found was trash or treasure. But someone somewhere did. And then he had started writing again; weaving short stories around the things he found. Over the years he had filled his drawers and shelves with fragments of other people's lives, and somehow they had helped to mend his -- so cruelly shattered -- and make it whole again. Not picture-perfect; of course not after what had happened. A life still scarred and cracked and misshapen but worth living nonetheless." "This was definitely the job for her. She would chain herself to one of the filing cabinets if necessary to secure it. Fortunately it wasn't." I felt that way when I met Eunice - she was definitely the character for me, and I would chain myself to her side if necessary to get to know her better. I loved her job, her friendship with Bomber and the adorable dogs they cared for, her sense of humor and her loyalty to the people she loved. She was so full of life! Laura paled a bit in comparison. She's lost her way, and I think Anthony hopes that becoming the keeper of lost things will be as healing for her as it was for him. I'll let you decide for yourself whether or not it is! There's a blossoming romance for her, which was sweet but fell flat for me. I just wasn't invested in it, but it's a minor quibble because Eunice's friendship with Bomber and Anthony's love for his fiancée more than make up for it! I figured out the connection between the characters early on, but I don't think it's really supposed to be a mystery. The magic of this book is watching the two stories come together and exploring the lives of the people who have lost things along the way. There are stories scattered throughout the book - brief descriptions of an object with notes on where and when Anthony found it followed by a story of how it was lost. I couldn't wait to get to each one because I'd immediately find myself invested and longing to know more about what happened next. The stories had the potential to seem gimmicky or distracting, but they ended up bringing so much depth to the book. In fact, those stories are what I'll remember most. My only real concern involves the young girl, Sunshine, who lives next door to Laura. Sunshine has Down syndrome and possesses somewhat of a sixth sense when it comes to the lost objects. I believe the "magical disability" is often a harmful trope, so this representation might be problematic. Other readers may be able to offer greater insight into the representation in this book, but I did think it was worth mentioning. In many ways, this book reminded me of a British version of Sarah Addison Allen (and I love her!). It had similar elements - the comforting setting, the quirky but loveable characters, the pinch of magic, and the heartwarming emotions. Despite the moments of grief and pain, there's so much laughter and joy in these pages. Hogan's writing is just so lovely! 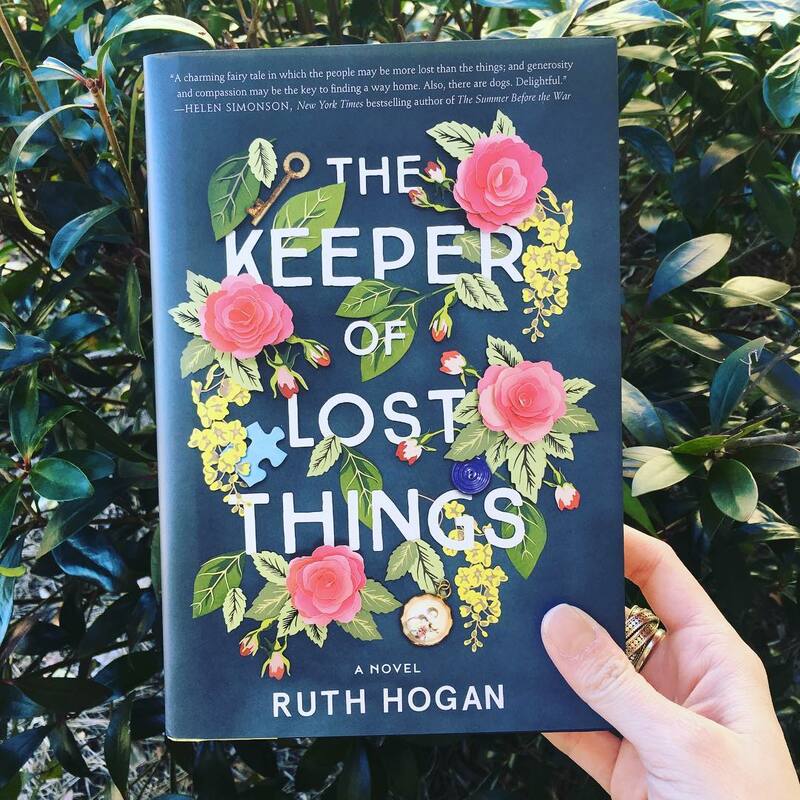 The Keeper of Lost Things is a testament to love, a celebration of life after loss and a moving depiction of friendship that I found utterly charming. "Her grandmother had once told her that one could blame ugliness on one's genes and ignorance on one's education, but there was absolutely no excuse whatsoever for being dull." I read about this in Library Journal, I think. (I know I was at the library when I heard about it, at least.) It sounds so quiet, interesting, thoughtful. Glad to see you enjoyed it. Just might have to snag a copy for myself! Thanks for reviewing! I adore the cover of this novel! And I definitely like the premise a lot too. The idea of lost things being collected and then being returned - it really appeals to me. Will have to check this one out!